Could this reverse the trend of the last few years, when Congress legislators defected in large numbers to the BJP? 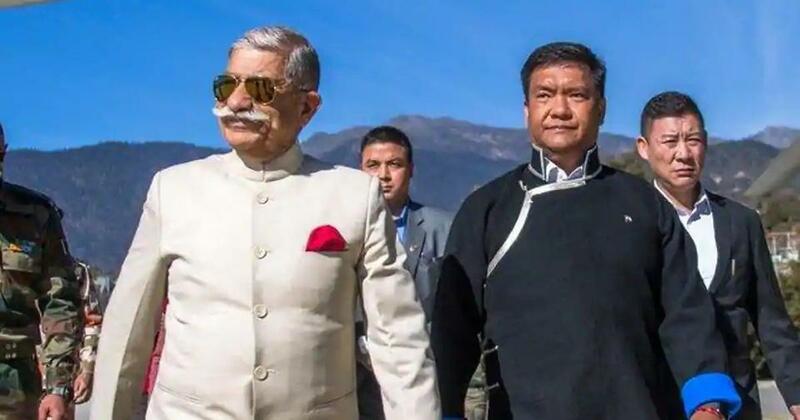 Arunachal Pradesh Governor BD Mishra (left) with Chief Minister Pema Khandu. In Arunachal Pradesh, politicians are switching parties and the beneficiary of these defections appears to be the Congress. This reverses the trend of the last few years, where the Congress saw an exodus from its ranks and into those of the Bharatiya Janata Party and its allies. Ruled by a BJP-led coalition at present, the state is likely to have Assembly elections around the same time as the Lok Sabha polls, in April or May. The most high-profile resignation from the BJP so far has been that of former Chief Minister Gegong Apang. On January 15, he quit the ruling party, which he had joined in 2014. He lashed out at the BJP’s central leadership in his resignation letter. It “hates decentralisation or democratic decision making”, he wrote, “the party is now a platform to seek power”. Soon after Apang’s resignation, two legislators from the National People’s Party – an ally of the BJP – also quit the party. The two legislators, along with two former ministers and a state executive member of the BJP, also joined the Congress. Rajesh Tacho, one of the two National People’s Party legislators who quit, said he decided to rejoin the Congress as the “BJP has not shown much interest” in giving him a ticket to contest the upcoming elections. “I have joined the Congress for now, but if the BJP gives me a ticket, I may rejoin again,” he said. Eri Tayu, who used to be a state executive member of the BJP, also expressed displeasure with the party’s ticket distribution process. “I have been sitting here for so many years,” he said. “They should have at least told me the reasons why they do not want to give me a ticket, but I was not even consulted”. Since the 1980s, the state has usually voted for the Congress or its splinter group, the Arunachal Congress. The BJP came to power in the state briefly in 2003 when Apang and the legislators supporting him switched over to the saffron party. Apang switched back to the Congress when the BJP lost the general elections of 2004. The government formed in 2014 was marked by similar upheavals. In the Assembly elections in 2014, the Congress won a comfortable majority, securing 42 of the 60 seats and installing Nabam Tuki as chief minister. But the party was riven by infighting from the start. In December 2015, Governor JP Rakhowa, a BJP appointee, advanced the Assembly session from January 2016 to December 2015 without the advice of the state cabinet. The decision plunged the state into turmoil and led to a month of President’s Rule, after which Kalikho Pul, a dissident Congress leader backed by the BJP, formed the government. In July 2016, the Supreme Court ruled that Rajkhowa’s decision was illegal and restored status quo as in December 2015. But Tuki still had to prove his majority in a floor test. He resigned on the eve of the test and Pema Khandu was elected leader of the Congress Legislature Party. Khandu, who was then appointed chief minister, migrated first to the People’s Party of Arunachal and then to the BJP in December 2016, and was followed en masse by supporting legislators. The state was rocked by Pul’s suicide in August 2016. The BJP is witnessing a churn across the states of the North East, courtesy the Citizenship (Amendment) Bill, 2016, which seeks to grant citizenship to Hindu, Sikh, Parsi, Jain, Buddhist and Christian refugees from Bangladesh, Afghanistan and Pakistan if they have lived in India for six years, even if they do not possess the necessary documents. Several BJP allies in the region, including the National People’s Party, have publicly stated their opposition to the Bill. In Assam, the party’s coalition partner, the Asom Gana Parishad withdrew from the government on January 7. One of the BJP’s own spokespersons quit in protest against the Bill on January 8. The BJP’s state president in Arunachal Pradesh, Tapir Gao, however, played down the recent exodus from the party, claiming that the defections were not related to the Bill. “The protests over the Bill have had no impact in Arunachal Pradesh,” he said, adding that the state had its own protective legislation that would make it immune to the fallout of the Bill: the Inner Line Permit regime. The permit is an official document required by outsiders to travel into certain places in the North East declared “protected areas”.